I'm looking for advice on the most affordable way to "upgrade" my Data East Star Wars (and several other games) audio by only replacing the speakers with aftermarket speakers that meet the factory spec. I'm not going to buy Pinsound or an amp or do anything to the sound board. I'm pretty sure my DE SW has two 4" inch speakers (4 ohm) and one 8" inch speaker (4 ohm). Should I buy 2-way or 3-way speakers for the 4" replacements? On the 8"... should I buy mid-range or is this really a "subwoofer"? Anybody been impressed with any of these cheap $15 speakers I've seen on Amazon? Thanks for the advice. I'm generally not this cheap but I've heard that just replacing those old factory speakers can make a huge audio improvement and I want to try this. Thank you! Not familiar with the Amazon speakers you refer to but the adage that you get what you pay for applies. If you are going to source the speakers yourself then you want full range speakers for the speaker panels. Aftermarket companies use a coax speaker (tweeter & woofer tied together) to give the fullest range. And for the cabinet speaker you can treat it more like a woofer. Some call it a middle channel, others refer to it as a woofer. Either way, that speaker does not need to be full range and the bottom end, lower end frequency, for this one is good. You may consider just adding an aftermarket sub-woofer underneath your pin and leaving your stock speakers in place. Some will say speaker material makes a difference, paper, poly, etc. Others will say that a bigger magnet helps overall sound. I recently upgraded my speakers in my LOTR and first looked to source them on my own including Amazon & other online sites and ultimately decided on the Flipper Fidelity upgrade, good price, proper spec. The only issue is that the tweeters stick out on the backbox speakers so you need to add a spacer to put the grills back on. 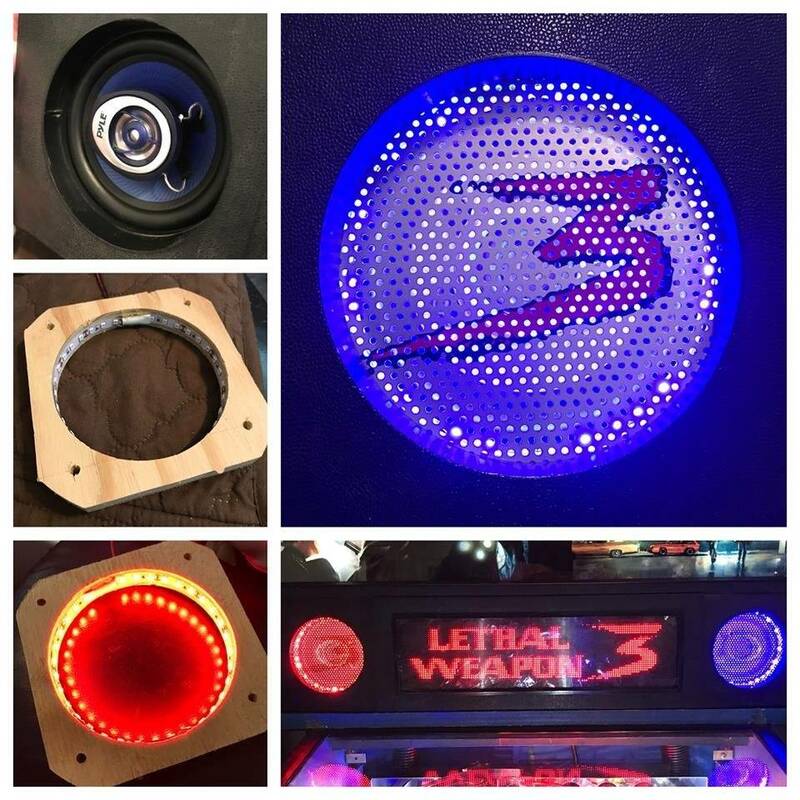 I did the same thing in my LW3 and build speaker lights into them. I haven't finished the DESW ones yet, so right now I've got the grills off. For the LW3 I bought a 8 ohm woofer, but for DESW I bought a 4 ohm subwoofer as the woofer was out of stock though Parts Express. They both sound fine to me. The 4ohm should theoretically be quieter but it works fine with the stock DE soundcard. Looks like its the opposite way now. I paid $12 + $7 shipping on the woofer/subwoofers. For what it's worth, the pinsound card in my LW3 sounds amazing. I'm going to have to move it to Star Wars and see how it sounds there. cabuford Thank you for the detailed info! When you say you had to create a "spacer" for the grills to go back on, is it that complex custom wood in your photo? I don't know that I have the skills to pull that off.